Prototype: 16 different German Federal Railroad (DB) 4-axle passenger cars. Type AByg "Umbauwagen", 1st/2nd class, type Byg "Umbauwagen", 2nd class, and type BDyg "Umbauwagen", 2nd class with a baggage area. Era IV; the cars look as they did around 1970. Model: The 16 cars come in an attractive display, 4 of each car type (AByg and BDyg) and 8 of each car type (Byg) with different car numbers. The "Umbauwagen" 1st/2nd class have Minden-Deutz design trucks. Some of the "Umbauwagen" 2nd class and the "Umbauwagen" 2nd class with a baggage area come with American design "swans neck trucks" and some come with Prussian standard design trucks. Each car comes individually packaged in a marked box. 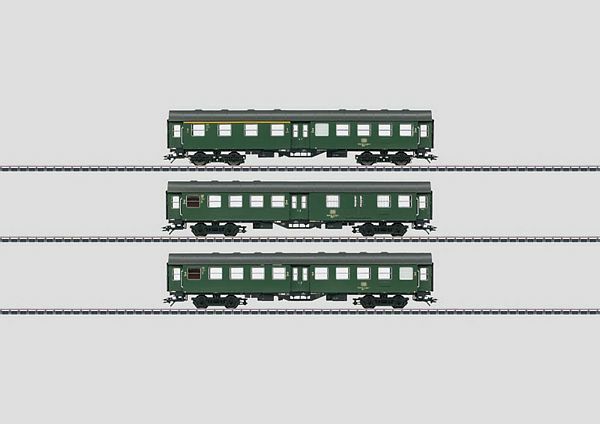 A decal set with different train routes is included with each car. Length over the buffers for each car 22.4 cm / 8-13-1/6". DC wheel set per car 4 x 700580. First time for "Umbauwagen" with Prussian standard design trucks and swan's neck trucks. Different car numbers and station assignments. Available separately at your authorized dealer in an easy to see display. The class 212 diesel locomotive available in the Marklin H0 assortment under item no. 37005 is the right locomotive for these cars.